New Annz: Cotton Sugar and Love Music kimonos! 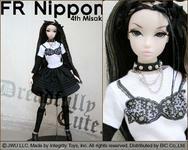 FR Nippon: Dreadully Cute! This is the first one I really like. Nice big pic in Haute Doll you can see how cute she is, pouty and freckled. Blythe: what is up with Blythe? I see ten million petites, a reissue of Tea For Two and some hippy??? And… wot? The LEs coming out are sooper, but geez. 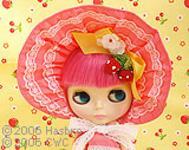 Super LE Blythe: Ichigo Heaven. Uh, yes! I love the new radiance face mold. Has some of the sweetness of a kenner! Gah! 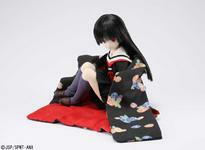 Azone: Hell Girl. Hobby Japan is carrying her, but I haven’t seen her anywhere else.